There’s little better than an afternoon picnic or barbeque in the backyard. However, it can be uncomfortable to be outdoors during hot summer days. Adding a little shaded area to enjoy the outdoors even when the sun is at it’s most intense can go a long ways towards allowing you and your family to enjoy the outdoors. One idea that will help you to address both issues at the same time is to create a covered outdoor kitchen. A pergola makes a great cover for such a gathering spot. You can adjust the spacing and angle of the slats to allow for different levels of shading, and the gaps will allow the heat from the stove or grill to easily pass through so it doesn’t get trapped underneath the roof like it would in many other outdoor structures. There is a drawback to having a pergola as the covering for your outdoor kitchen though, and that’s rain. So this might not be the best idea for those in wet climates. Though if you do really want to go with a pergola in such a case, you could integrate a fabric rain-proof cover into your pergola. Perhaps the best reason to use a pergola as the cover for your outdoor kitchen is that you can use it as an arbor or trellis for your garden plants. Tomato vines can be trellised on a pergola, as can cucumbers, grapes, or various other fruits and vegetables. Meaning you always have vine ripe produce ready at hand in your kitchen! If you trellis flowering vines on your pergola instead, it can help to create a beautiful and tranquil environment. Either way you can create a more natural feel to your outdoor kitchen, and add extra shading from the plant canopy. When adding a new feature you your yard, you have a lot of choices about what you end up building. 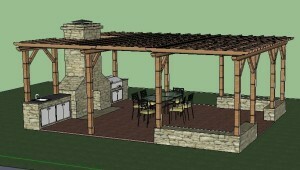 Pergola, gazebo, or otherwise, many of the planning stages are going to be very similar. This is somewhat because of how similar the buildings are in many aspects. More importantly though, it is because the real design at work isn’t just the structure you will be building, but also how that structure will integrate with the rest of the home, yard, and garden. This type of overarching landscaping design is something that you need to bear in mind when formulating your specific pergola designs. Without consideration for other structures and features in your yard, even a beautiful pergola can end up hindering various activities in adjacent areas, or even undermine the aesthetic appeal of your home. There are different ways to go about building a pergola. DIY types may have already stopped reading this to go out and build their own, but not everyone can be a handy handyman with all the tools necessary to build such a structure. For those people, there are kits available which can be put together rather quickly with minimal need for tools … or skills for that matter. The problem with kits is that they often include sub-standard materials. They may be poorly fitted, or simply made out of cheap materials which won’t hold up to the stresses of being outdoors through the seasons. With a rather simplistic structural design, pergolas may be the right project for those who are considering jumping into the DIY pool though. The design of a pergola is such that it can be easily pictured before hand, and the types of cuts to make aren’t very complicated either. Of course on the other hand, a pergola ends up being quite a lot of suspended weight, and miscalculating the supports needed can end up disastrous. Carefully consider the type of materials you will use when building your pergola. Wooden pergolas are the norm, and for good reason, but other types of materials can be used to good effect as well. You can even use a combination of materials to utilize the strengths of each, and to help create a more interesting visual interaction between the components. One material that is well suited for pergolas, or at least some components of pergolas, is wrought iron. Sturdy and with a classic look, you can be sure that wrought iron posts will stand for a lifetime … at least so long as you are willing to maintain them properly. Combined with wooden runners, this can be a visually pleasing pergola and one which has strong and heavy supports, with lighter weight joists. Aluminium is another material that pergolas can be made of. This metal is most useful because of how well it resists the elements. Aluminium will not corrode or rust. It is also strong and lightweight. As such, it’s a great material from a functional standpoint for just about any outdoor building project. The problem with aluminium is that it often looks rather out of place in a garden environment. Straight and mechanical looking, it would be more at home at the side of a pool or walkway. Of course you can have aluminium cast and finished to look much like wrought iron, but generally the aluminium pergola kits you will find have nothing of the sort, or worse yet, tacky attempts at it. It may seem strange given the basic pergola design, but pergola canopies are becoming more and more common. Perhaps this is because pergolas don’t protect against the rain and sun very well in most cases, and so to add functionality to their pergola owners want to add something more roof-like … if only temporarily when inclement weather strikes. The right pergola cover can be a difficult thing to figure out though. As it’s not a terribly common feature, there aren’t a lot of similar pergolas around that you can draw inspiration from. An important thing to bear in mind when looking for a pergola canopy, much like when looking for canopies for awnings or gazebos, is that not all canopies are created equal. Some will leave you to get soaked because they haven’t been waterproofed. Others may be so flimsy that they won’t last out the year. Make sure you find a quality canopy for your pergola, and the extra cost will pay itself back many times over. As an alternative to a canopy, you can add glass or plexiglass to your pergola. This has the benefit of acting as a roof while not looking like it. The structural highlights of your pergola will remain fully visible, as will the sky filtering through the rafters above. This can be great for when you need protection from rain storms, but don’t want to clutter up the look of your pergola with a canopy. When it’s the sun, not the rain, which you seek shelter from, using your pergola as a trellis is a great idea. Vines and other crawling plants can be trained up to the pergola deck, and there they can spread out their shoots and leaves to help shade below. Not only is this great to create a cool and private area to relax in, but it can also help you make your pergola into a productive garden feature. As one of the most simple structures you can add to your yard, a DIY pergola makes a lot of sense. You should still be careful about the design phase of the project though, as there are a lot of subtle and important elements that can dramatically change the use and visual appeal of a pergola with only slight modifications. For instance, the angle at which the slats are installed can change the amount of shade that they cast at different times of day or year. Also the orientation of the slats have a similar effect. A pergola is not an expensive project either. With minimal materials it’s something that can be done quite inexpensively as a DIY project. Going with a prefab kit can be another way to get a cheap pergola that still is of good quality. In this case you are saving money on the fabrication, as that can be done at the factory very efficiently. Also you are saving on labor costs, as prefabricated pergolas are very easy to assemble. It is important to make sure you carefully examine the kit first to ensure it’s of high quality. Sometimes these kits are not well designed and use shoddy materials. So buyer beware! If you’re looking for somewhere to facilitate your climbing plants, pergolas are right up your alley. With their design structure, they make excellent trellises once you get the vines up to the top of the pergola. All those slats gives climbing plants plenty of places to take hold, and the gaps in between allow fruits and flowers to hang through to increase the productivity and beauty of the plant. There are some problems with using a pergola as a trellis though. The main one being that the main “trellis” portion of the pergola is going to be so far off the ground that many vines, especially productive vegetable ones, may have difficulty in reaching the main area they can spread out in. This isn’t a problem for things like ivy or other very long vines of course, but it does limit what you can trellis on a pergola without making some modifications to your designs. One way in which you can mitigate this effect is to include a trellis up to the top of the pergola on at least one side. This will give the shorter vines somewhere to spread out even if they aren’t able to use the upper deck of the pergola very much. It can also be a wonderful privacy screen and help to block the sunlight in the late afternoon when positioned properly. Another modification that you can make, which highlights one of the benefits of DIY pergolas over prefab kits, is to incorporate planters or at least places to hold container plants into the design of your pergola. By allowing the vines to be planted nearer to the top deck, you decrease the distance they must traverse before spreading out on all that free area. This is something that you may find pergola kits just aren’t up to allowing. Either they will not be able to hold the extra weight of the suspended soil in the containers, or they may not have anywhere suitable to do so. This type of elevated container gardening can allow you to trellis even relatively short vine vegetables such as cucumbers, cantaloupes, and watermelons on your pergola. With the heavier fruits just make sure your pergola is up to holding all that weight. Also you will want to support the fruits individually so that they won’t break off their stems. It’s funny how sometimes there’s too much light for comfort, and other times not enough. A pergola helps to address the first issue simply by it’s structural design. Limiting the amount of sunlight that is allowed through, the slats and other structural members can help to create a cooler and more comfortable area underneath the pergola. At night though, shade is not a concern. The structure of a pergola can still help out though. By installing lighting on your pergola, you can help to increase the usefulness of the structure and create a wonderful place to spend your evenings. Pergola lighting ideas are somewhat limited by a couple main factors though. You may find that it’s difficult to include much in the way of lighting without detracting from the look and usefulness of the pergola. With no roof to keep off the rain and snow, the wiring needs to be well insulated against the elements. Also, with a bare-bones type of structure, it’s harder to hide the wiring so as not to detract from the design and materials it is comprised of. In many cases, the best bet may be to run the wiring through conduit installed on top of the slats of the pergola. This way the wiring will be protected by the conduit, and the conduit hidden from view from below. It can still be difficult to find a suitable way to run electrical wiring perpendicular to the slats though, and so relying on this solely for running your wires would limit you to lighting along one slat. With hollow elements such as metal pipe or vinyl pergola materials, you may find that these issues become much less of a concern. The wiring can be threaded through the structural elements and so only be exposed at outlets. This will afford the wiring a lot of protection against the elements if your joints are well sealed. The main issue to look out for when wiring this way would be later modifications, such as driving screws into the beams to hang plants from. Always remember there is wiring inside so that you can avoid potentially dangerous situations.